Welcome to Costessey Baptist Church Costessey Baptist Church on The Street at Old Costessey has been in existence since 1798. The Chapel you see above was opened for worship in 1822. The Church is a member of the Baptist Union of Great Britain and supports the Baptist Missionary Society and Home Mission. Behind the Chapel is a cemetery and alongside is the hall which was completed in 1969. There is additional parking on grass behind the hall. Our vision is to see God's Kingdom grow through a healthy Church living as a wholesome community engaged in relevant mission. We witness to the love of God in sending his only Son Jesus to be the Saviour of the world. We encourage people to live a life reflecting that love; in word, thought and action. We proclaim the love of God that brings salvation through Jesus and a call to Christ-like living. 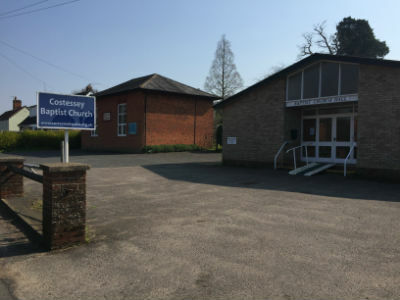 We are a friendly and active church, meeting on Sunday mornings for worship and Sunday School.Throughout the week there are a variety of activities for all ages. We give a warm welcome to anyone living in, visiting or new to the area to join us on a Sunday or during the week at any of our activities which are appropriate. Celebrate with us on Easter Sunday and BOOK IN for breakfast at 9am followed by Communion. At 10.45 there is a worship service to thank Jesus for His amazing Love and our Hope through His death on the cross. "Your Word is a light to guide my feet and a light for my path"
Please browse this website for more information. You may find the Pastor's Page helpful. If you would like to know more about the church or the Christian faith, please contact Pastor Peter Lillystone. Click reference above to read more from the Bible.